Brent practices primarily in the areas of business, trust and estate planning; trust and probate administration; and immigration law. His business, trust and estate planning practice includes all areas of lifetime and testamentary planning concerning estate preservation and tax efficient property transfers among family members, business associates, friends and charities in the United States and around the world. His immigration practice encompasses the full range of business, investment and family immigration law. Brent has Martindale-Hubbell’s highest rating of AV and is included in Marquis’ Who’s Who in American Law. Brent received his J.D. from Columbia University School of Law, where he was the case note and comment editor for the Columbia Journal of Transnational Law. Before opening his office in Mesa in 1996, he was the partner in charge of the estate planning and business immigration practice areas at Brown & Bain P.A. in Phoenix. He is a member of Wealth Counsel, a national collaborative business and estate planning organization; the East Valley Planning Council; and the American Immigration Lawyers Association. He has served on the Board of Trustees of the Maricopa County Bar Foundation and other charitable organizations. He is currently on the Professional Advisory Board of the Arizona Community Foundation. He has been very active as a leader in various capacities with the Boy Scouts of America and has coached several youth sports teams. 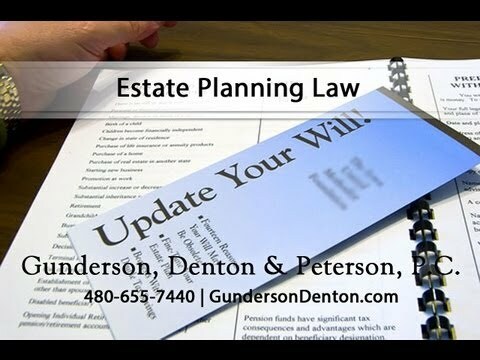 Read the rest of Estate Planning Law at Gunderson, Denton & Peterson, P.C.